Power of the Press doesn’t bother with subtlety. 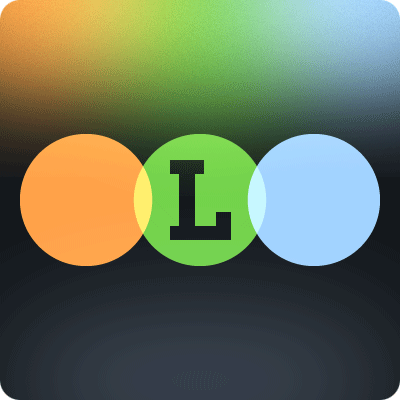 It’s a film that focuses like a laser on the power that the press can wield and how constructive/destructive it can be in the right/wrong hands. It’s a story and a setting that makes the Sam Fuller connection seem like a given, but unfortunately little of Fuller’s biting social commentary or affecting dramatics make it to the screen here. 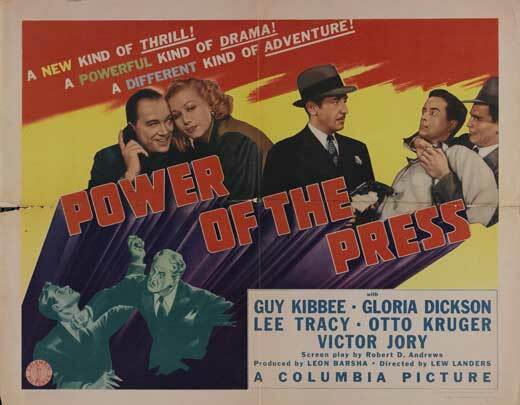 Power of the Press is an enjoyable little movie, but it’s one so straightforward and obvious that it’s almost pointless to watch. The film opens as John Carter (Minor Watson), the publisher of the New York Gazette, is about to give a speech about the freedom of the press. What stops him from heading out and delivering the speech is an editorial in a small Nebraska newspaper that was recently sent to him. The editorial was written by an old friend, Ulysses Bradford (Guy Kibbee), and it takes Carter to task for being at the head of a completely corrupt newspaper that cares little for the truth. Bradford writes that freedom of the press means freedom to tell the truth, not the freedom to twist the truth. Carter has a moment of clarity, so he decides to ditch his planned speech and just come clean. He’s been distant from the day-to-day work, and has allowed the very obviously corrupt Howard Raskin (Otto Kruger) to run the paper. But Raskin can’t have Carter’s recent clarity ruin his good thing, so he has the boss shot mid-speech! 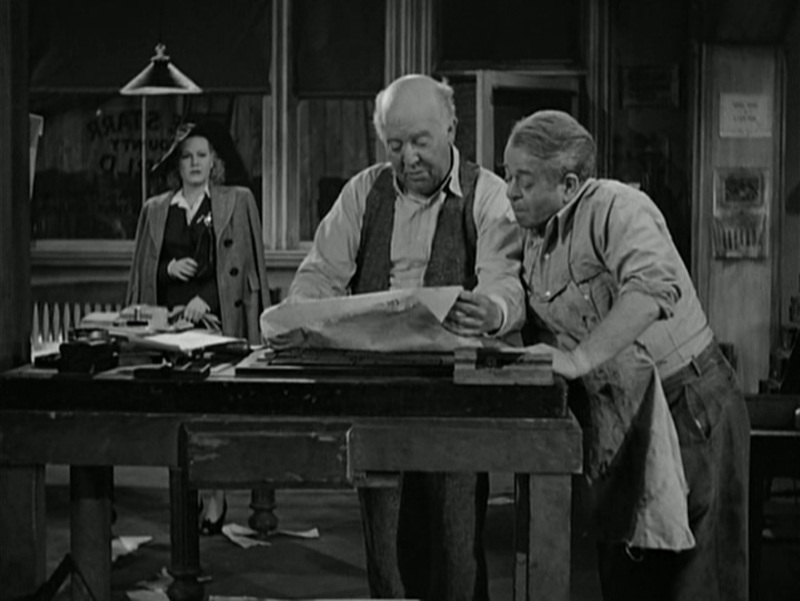 Carter doesn’t die immediately, though, and while hanging on for a day or so he writes a will that gives a controlling portion of the New York Gazette to his old friend Bradford. Enter the most unlikely heroic duo to lead a movie: the upstanding, 60-something small-town editor and Carter’s no-nonsense secretary (Gloria Dickson). It’s up to them to save the day and the truth! This is actually a great setup for a movie about journalistic freedom and integrity, and Fuller’s original script may have been just that. The film was made in the middle of World War II, though, so it comes off as quite the preachy propaganda piece (the evil Raskin is helping to thwart the American war effort through the paper). This was written prior to Fuller’s war experiences so it’s possible that this strictly black-and-white view of good and evil is representative of his viewpoints at the time, but I’m of the mind it’s more of a studio rewrite thing than anything else. Fuller makes a passing mention of the film in his autobiography, but he only relates the basic storyline of his original script (the handover of the paper to the old friend) and offers no opinion or commentary on the finished film. Power of the Press is predictable, but it did get me thinking about how the base theme of the media’s power to sway public opinion is still very applicable today, if not more so. There’s even a moment when Bradford mentions that it’s their duty as newspapermen to help protect the little people who make up 99% of the country! All this made me wonder if Hollywood would greenlight a film such as this in today’s media climate. There may have been one already, but I can’t think of anything off the top of my head (especially not something this forward about it). Regardless, now more than ever it is vitally important to be properly informed and not allow the twisted truth of slanted news outlets to drive personal and public opinion. So while Power of the Press is too standard and obvious to be a great film, it’s a good, quick movie that has a message still pertinent over 70 years after its release. That’s gotta be worth something.